Stuffing veggies really takes them to a whole other level! I loooove zucchini, so I am always trying to find ways to add it to meals. One of my favorite ways to eat it is stuffed zucchini. It makes for wonderful presentation and tastes divine! I used to beg my best friend to make this for me whenever we lived together in college. 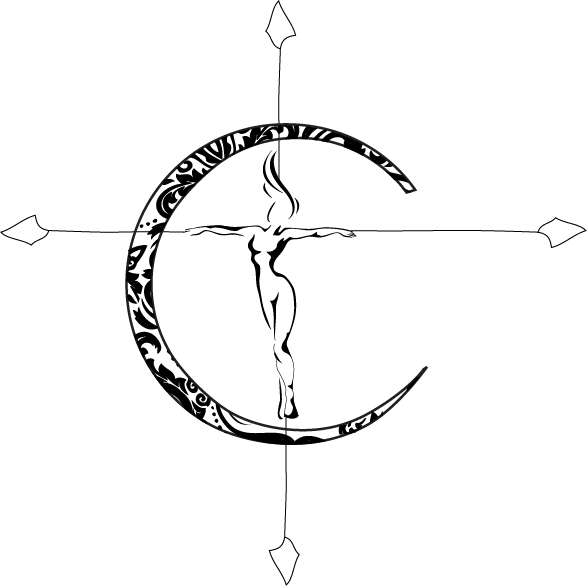 It always seemed so complicated to me so it took forever to try to do it myself. 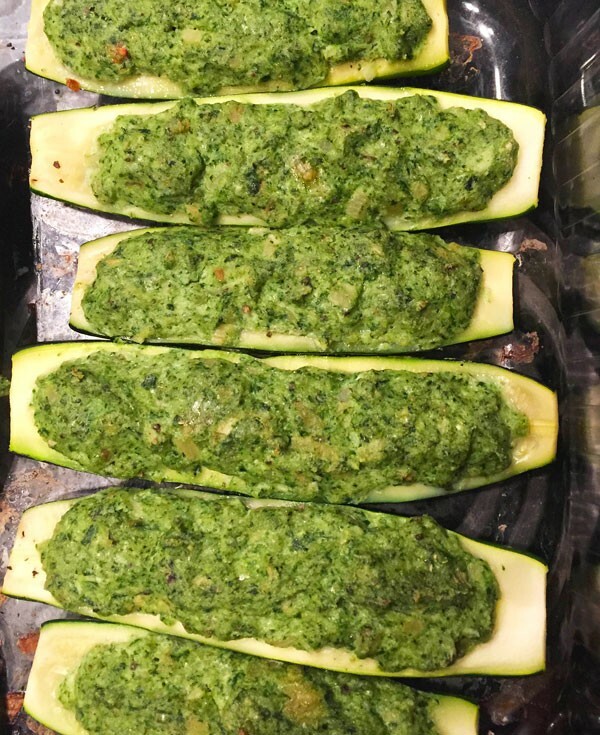 Once we moved out this was one of the first recipes she sent to me since she knew how obsessed I was with these zucchini boats. She still makes it by request when we visit each other, so it’s obviously remained a favorite of mine! Now that I know how to make it I’m sure I will come up with a few different types of fillings…. 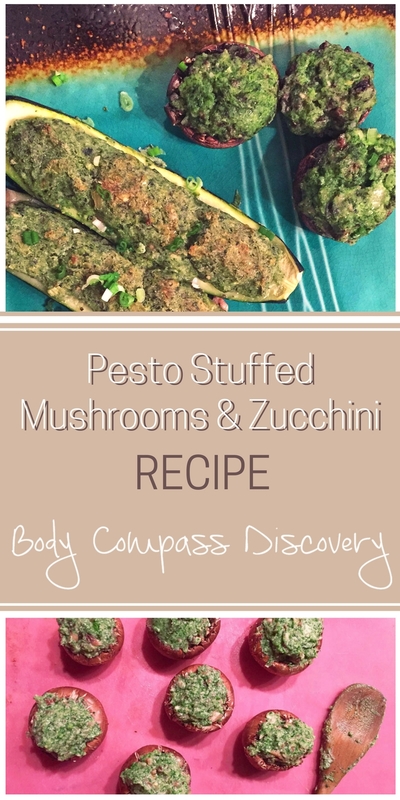 Stuffing zucchini and mushrooms with a cheesy pesto is so flavorful and a deliciously creative way to get some more greens in to your diet! 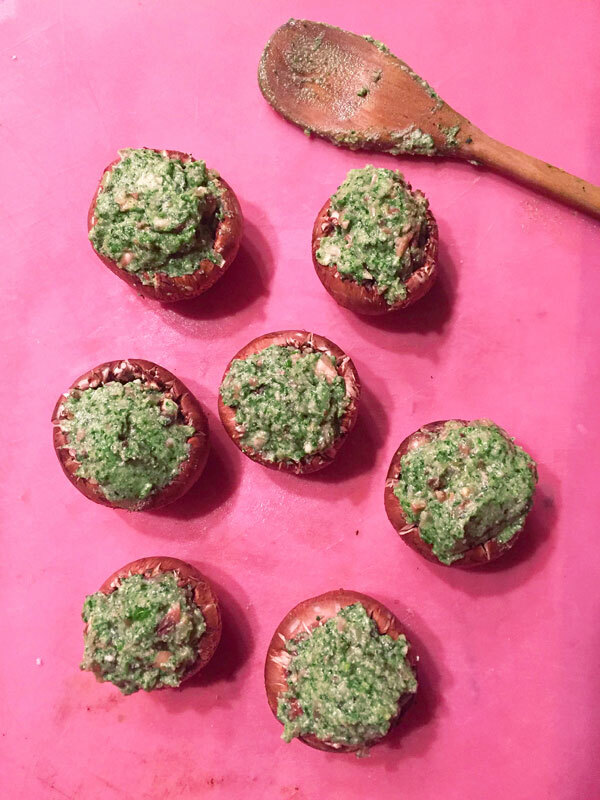 This pesto ricotta stuffing can also be done with mushrooms in just the same way. They are quite a bit easier since it’s not as time consuming to remove the centers. I chose to do both together for demonstration, and because they pair nicely! – Begin by trimming the ends from the zucchini and cook in a large sauce pan of boiling salted water for 5 minutes. – Cut the zucchini in half lengthways and carefully scoop out the centers using a teaspoon. Carefully pop the stems out of each mushroom cap as well. Be sure to save both of these parts for the filling! Make sure the outer edges are about 1/8 inch all the way around so the zucchini boats are not too flimsy. – Chop the zucchini and mushroom centers finely and put into a bowl. Add the ricotta, oregano, garlic, parmesan, egg yolk, salt and pepper. Mix thoroughly. 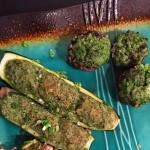 – Arrange the zucchini and mushrooms on a baking tray and fill with the ricotta pesto mixture. – Bake at 350 for about 35 minutes until the zucchini are tender and the filling is golden brown. The mushrooms may take slightly less time. Serve when ready! As long as the filling is the right consistency then it should not spill over the edges much at all. These are best eaten as warm as possible so the cheese is still gooey! 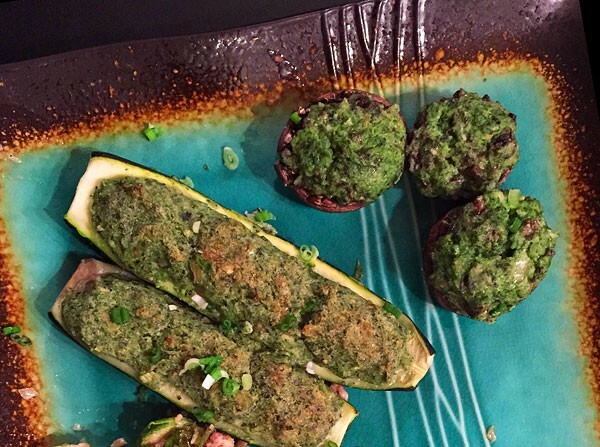 Mushrooms and Zucchini stuffed with ricotta pesto. Trim the ends from the zucchini and cook in a large sauce pan of boiling salted water for 5 minutes. Cut the zucchini in half lengthways and carefully scoop out the centers using a teaspoon. 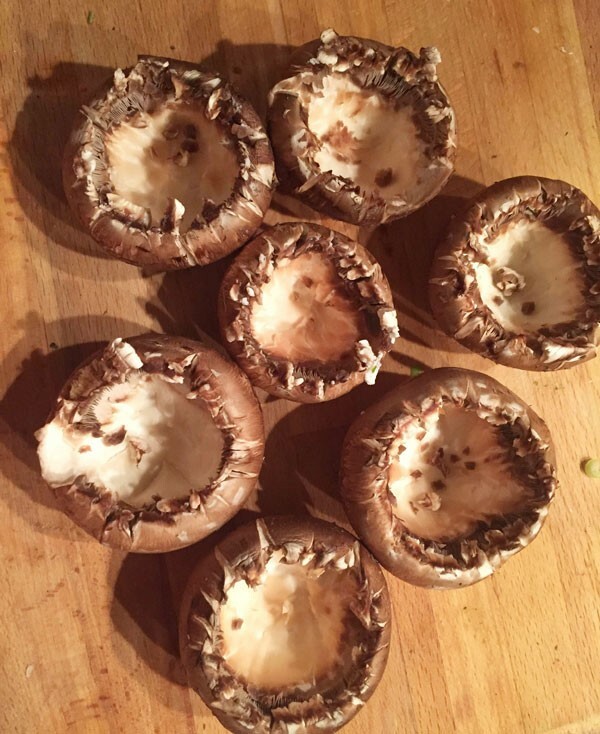 Carefully pop the stems out of each mushroom cap as well. Be sure to save both of these parts for the filling! Make sure the outer edges are about 1/8 inch all the way around so the zucchini boats are not too flimsy. Chop the zucchini and mushroom centers finely and put into a bowl. Add the ricotta, oregano, garlic, parmesan, egg yolk, salt and pepper. Mix thoroughly. Arrange the zucchini and mushrooms on a baking tray and fill with the ricotta pesto mixture. Bake at 350 for about 35 minutes until the zucchini are tender and the filling is golden brown. The mushrooms may take slightly less time. Serve when ready! A dash of milk can be added if the mixture is not creamy enough, but it should be a light fluffy texture. I have also made this with oil instead of egg and it works just as well! 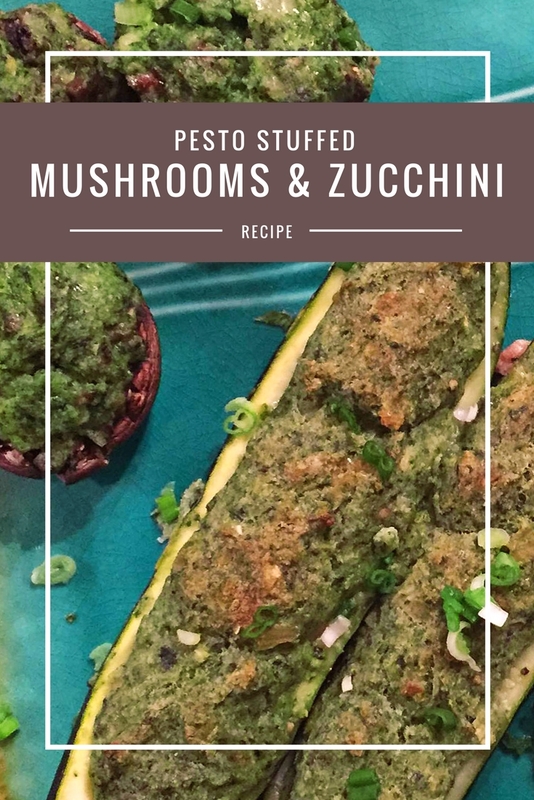 These pesto stuffed mushrooms and zucchini are wonderful as an addition to something else or if you make enough they can be a tasty meal on their own! I personally suggest a light type of seafood to accompany these vegetables. 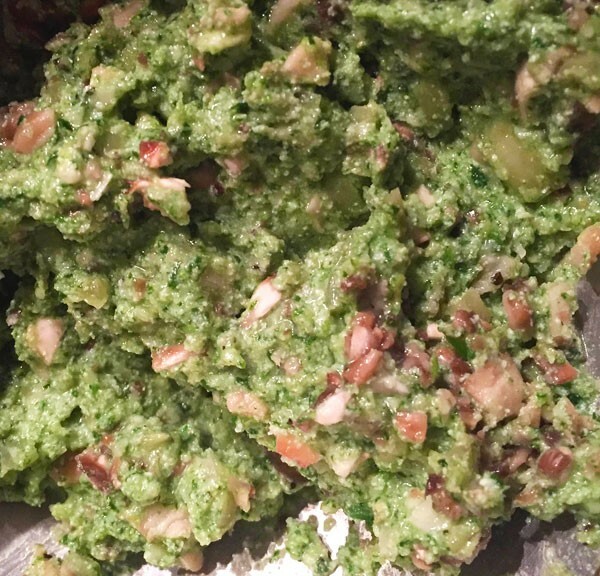 I cook with pesto quite often, so if you like this recipe check out my basil pecan pesto tilapia! I would love to upgrade my main cutting board to a sleek one like this! That looks so good!! I’m always looking for new recipes and I LOVE zucchini! Wil have to try it. Thanks for sharing.